A 21-year-old woman, Rebecca Bassey, has been arrested by the Lagos State Police Command for allegedly beating her husband’s three-year-old niece, Deborah Bassey, to death. According to police authorities, the suspect beat up the girl because she vomited and defecated on herself.The incident occurred at Ijaiye Ojokoro area of the state on July 22, 2013. “The victim (Deborah) lost her mother in 2010. Early this year, Deborah’s father was evicted from his home and he decided to send Deborah and his second child to go and stay with his brother, Vincent, until he settles down. 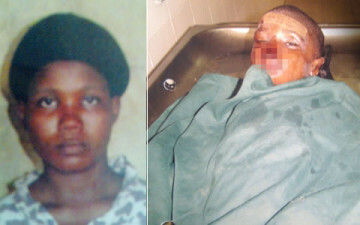 According to police investigations, on the day of the incident, Deborah woke up around 5.30am with a high temperature. The three-year-old girl was said to have started vomiting and defecating soon after. This was said to have angered Rebecca, who instead of administering treatment to the child, decided to beat her up. The impact of her hitting her head against the edge of the wooden chair caused her to start bleeding. Some neighbours rushed her to Ahmadiyya Hospital, where she was referred to Orile Agege General Hospital where she later died. A woman leader in the area, Kudirat Ogunseyi, was said to have reported the matter to Ijaye Ojokoro Police Division after which the suspect was arrested. Some neighbours, in their statements at the police station, described the suspect as a hot-tempered woman, who was fond of beating the children. “The way that woman beats up the children was very worrying to the extent that the landlord had threatened to evict them,” one of the statements reads. Vincent told the police that he was not present when his wife beat his niece to death. “I was not at home when the incident happened. I am a photographer during daytime but I work as a vigilante group member. So I hardly sleep at home,” he said. The suspect, in her defence, said it was not a deliberate act, as she had only pushed Deborah and she hit her head against the chair. “I am a housewife and I have a 10-month-old baby. I did not mean to kill her (Deborah). I only pushed her because she vomited and defecated on the floor. I was only trying to correct her. It was not deliberate. I am a mother too and I know how I would feel if my son was killed,” she said. It was learnt that the matter had been transferred to the State Criminal Investigation Department, Yaba. A source at the SCID said the police were waiting for autopsy. He added that if other wounds were found on other parts of the victim’s body, it would prove that the victim was indeed tortured before her death.